In 2002 or 2003, to please a new boyfriend, my daughter made three massively huge Doctor Who scarves. She carefully chose the colors of acrylic yarn (two were similarly muted and one was all reds and purples) and got very busy, working on the scarves while watching TV at night. I was jealous that she had a project to work on so I took up knitting again and became Obsessed With Knitting. The rest is history. 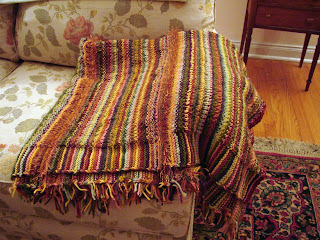 Anyway, I got tired of having the acrylic leftovers in my natural-fibered knitting room, so I took them up and made an afghan out of them. I used a tweed stitch from one of the Harmony Guides . It goes K1, slip1 with yarn in front as if to purl. Even numbered rows are all purl. The knits and slips are offset: the 2nd right side row goes K2, slip 1. I changed colors every 2 rows, so I could use up the Doctor Whos. What happened to my color combining genius? Out the window. I did learn something from this fiasco, however. 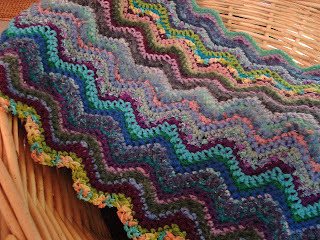 One, do not use the ripple stitch in crochet, especially in stripes. I had made a section like this where the colors were good together by accident and made it into a scarf, but that was a fluke. Two, in combining blues and greens, severely edit the colors. 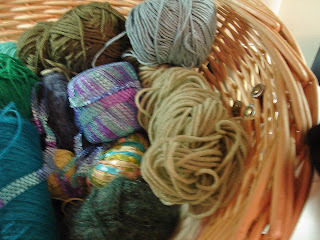 In my next attempt at the blue and green afghan, I plan to use the richer, deeper colors on the top and eliminate the lighter, muddier colors on the bottom. 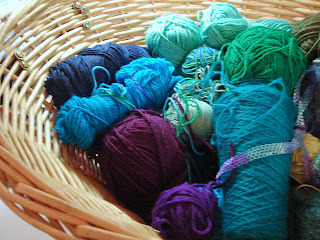 I'll also go back to my trusty tweed stitch, which I seem to be using for everything lately. I just finished a scarf in this stitch pattern, and last year I made two men's sweaters in it. Today in Ravelry I spotted a fabulous Jean Frost jacket in a three color version of it that I immediately put into my queue. So more on the tweed stitch in the future.